The specialist for direct room air humidification, DRAABE, has moved into its new site in Norderstedt under the new name Condair Systems. 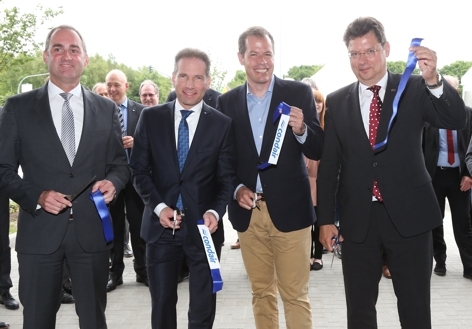 The 8,500 m2 new building was opened officially on 9th June and shows how a healthy indoor climate can be implemented in a sustainable and energy-efficient way thanks to the latest building technology. The new European production and logistics centre of Condair was built in less than a year immediately next to Hamburg Airport. With around 700 employees, the Swiss Condair group is the world's leading manufacturer of commercial and industrial humidifiers. At the new site in Norderstedt, Condair has brought together production facilities from four European countries. In addition, Draabe Industrietechnik GmbH, which specializes in direct room air humidification, has also moved into the new European headquarters. DRAABE has been part of the Condair Group since back in 2001 and is now responsible for the sale of direct room air humidification in Germany and Central Europe under the new name Condair Systems GmbH. With around 8,500 m2 of space, the architecturally challenging building will initially offer a workplace for 130 employees, with this number increasing to 200 over the medium term. The utmost importance was placed on creating health-promoting and innovative workstations. Innovations and technologies from the company’s own product range are used to create an optimum indoor room climate: besides decentral gas-powered steam humidification with integrated heat recovery, various direct room humidifiers are also installed in the production and administration areas. These enable humidification peaks – e.g. in winter – to be covered as well as locally ensuring a healthy relative air humidity between 40 and 60 percent. The temperature lies between 22 and 24° Celsius throughout the year and is controlled via a switchable heating/cooling ceiling system with the active use of the building mass. A look at the building’s energy balance shows that a healthy, comfortable indoor room climate does not conflict with sustainable construction: By combining geothermal energy, photovoltaics, a green roof and optimised building automation, the building almost achieves passive-house standard. Predicted CO2 savings of around 100,000 kg/year and an energy consumption of 50% below the requirements of the German Energy Saving Regulation also make the new Condair site a flagship project for sustainable construction. Video about the construction of the new European headquarters. Opening ceremony for the new Condair site. 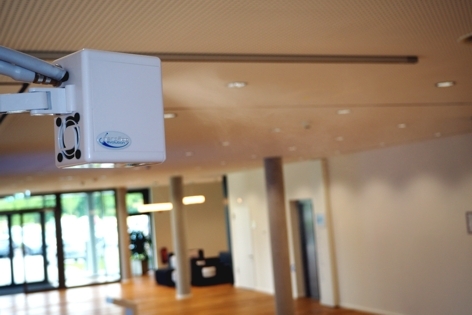 Draabe direct room air humidifiers guarantee a healthy indoor climate in the foyer of the new building.